You won’t find it in any of the most expensive and exclusive ristorantes along Venice’s Grand Canal; not even at the world-famous Restaurant Terrazza Danieli. It’s only available once a year, and then only to those who are insiders. 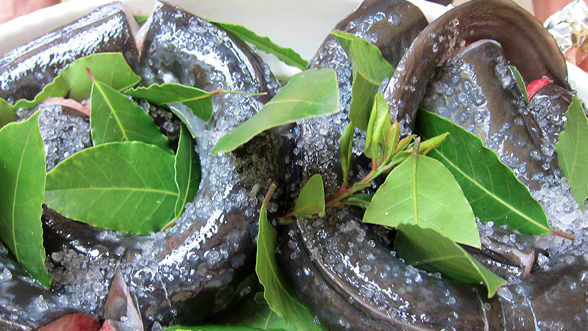 The dish, however, is both remarkable and remarkably simple: furnace-roasted eel combines eel, salt, and bay leaves. The cooking facilities necessary for getting it just right are only available to those with access to a glass furnace. It’s an uncommon delicacy, a Christmas tradition eaten once a year by the glassblowers at Vetreria Archimede Seguso. As host of Bizarre Foods with Andrew Zimmern, his eponymous food-based travel show on the Travel Channel, chef Andrew Zimmern travels to Venice in an episode that originally aired on February 1, 2011. In between indulging in regional delicacies such as cuttlefish in black ink, razor clams and risotto, and shrimp right out of the ocean, he travels to nearby Murano to meet Antonio Seguso, grandson of the late Archimede Seguso.